Bathed by the clear, warm waters of the Gulf Stream, the coast of North Carolina offers some of the best scuba and wreck diving in the United States. Whether interested in sight-seeing, underwater photography, maritime or military history, a technical diver or just beginning, from Cape Hatteras to Cape Fear, the abundant marine life and numerous shipwrecks of North Carolina offer something for scuba divers of all interests and skill levels. 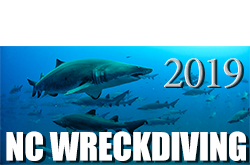 Civil War wrecks, sailing ships, artificial reefs, fishing vessels, etc. Mileage Chart, Airports, Highways, Ferry Schedules, links, etc. Find out what the fish are doing when you aren't looking! BFDC Trip Reports - Now of Facebook! Want to use material from this web site?